The pan-European fiber operator Interoute added a bit more fiber to its network at its southern frontier this morning. They've added a new route to the rest of Europe from their landing stations in Mazaro del Vallo on the island of Sicily and Bari on the Adriatic Sea. 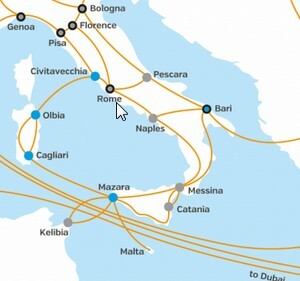 That's the toe and the heel of the boot for those with a more visual image of Italy, and the new route follows the southern coastline while adding 1,300 route kilometers of fiber. It provides new diversity to those submarine cables that land there rather then go all the way up to Marseilles, supplying three new 100G routes back to the rest of Interoute's European fiber network. More of Interoute's focus lately has gone toward its cloud services, so it's nice to see a bit of news on the fiber side. They did also make an inorganic move up in the UK with the purchase of Vtesse last year, giving them deeper British reach.